When Hitler became Chancellor of Germany soon after the Reichstag building was set on fire, allowing Hitler to issue a State of Emergency. This took all constitutional liberties away from German citizens and allowed the Nazi Government to arrest communist leaders. There was also a communist man found inside the burning building, so it was believed that the communist party was to blame for the Reichstag fire. Along with blaming the communists, the Nazi Party also used this event to gain more political power, and soon thereafter enforced the Enabling Act. The Enabling Act granted the Nazis the ability to eliminate the remaining Social Democratic Party, thus establishing the Nazi Party as the single powerful political party. This major event gave the Nazis much more power, and because this was an Act, it was easy for the Nazi Party to maintain it. In Animal Farm, the pigs establish themselves as the overruling group of Animals, and like the Nazis, only the pigs can discuss problems and make decisions for the farm. However, the unquestioning obedience to a single leader is taken one step further than only listening to the pigs. In addition this, the animals were also prohibited from interacting or trading with different farms, because this would be a sign of allegiance to another farm, such as Frederick's farm. 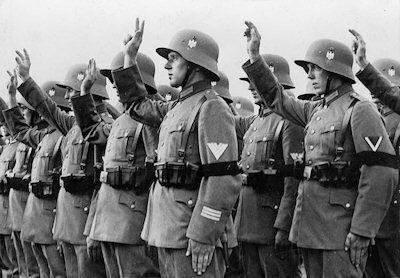 In order for Hitler instill his power over his people, he made it mandatory for anyone of military service to pledge a personal oath for Hitler. Hitler made German officers, soldiers, and civil servants swear to an oath of allegiance to Hitler himself, pledging personal loyalty to Hitler rather than the constitution. This is an example of the Nazi Party using every opportunity to reinforce public praise for Hitler, again strengthening his power as a ruler and dictator of Germany. The oath is similar to the Seven Commandments that the animals follow in Animal Farm, written out by Old Major, the original leader of the barn in Animal Farm.